One of the frills of promoting more than one style of illustration. 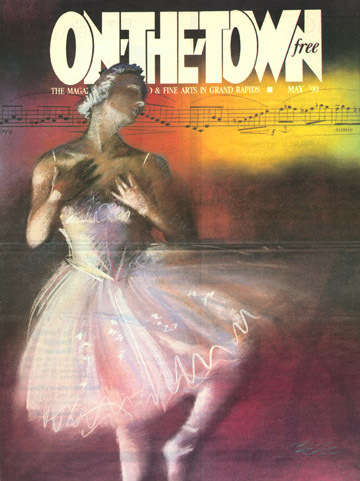 Less than six months after I did a cover illustration for On The Town, a local arts magazine, they wanted another in my ‘pastel’ style. I remember being quite thrilled at these cover assignments, which were seen all over town, but in hindsight, the pay was negligable, the exposure swift and fleeting, and it wasn’t much more than an ego boost when it was desperately needed. I picked up a few new national clients this month, a piece for Sailing World, and a series of conceptual illustrations for a magazine called Chronicles out of Rockford Illinois. This was the first assignment I had where I was asked to illustrate a more ‘esoteric’ series of articles (illustrating an ‘idea’ rather than something a bit more concrete), and I remember being rather stressed out by this one, barely getting my head around the articles I was reading. Six months after launching my freelance career, I landed my first cover illustration assignment, and boy was I excited. 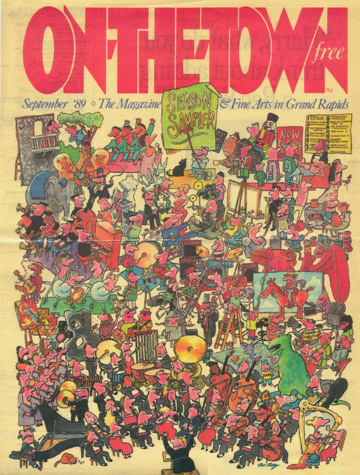 This was a local arts magazine, called On The Town, which was handed out free at various local venues, and they wanted an all-inclusive ‘season sampler’ cover, for which I pitched the idea of a crowded scene of every possible artistic situation I could think of done in a loose cartoon style. It is amazing how much time I must’ve spent on this one. I remember the original art was somewhere in the neighborhood of 24 x 36 inches. The pay was a whopping 100 dollars. But I was able to grab lots and lots of free copies when it hit the newstands. Another nice bonus, was the fact that they couldn’t decide between my various styles, and also wanted another cover done in the spring of the following year. If I remember correctly, they were both commisioned at the same time. By September of my first year in business, my only clients consisted of local design agencies, and publications (Grand Rapids Magazine started using me for black and white cartoon work – the art director ended up being a fellow I went to college with), and work funneled through my previous employer (and the occasional gag cartoon sale). My first big paying job was a pair of pastel drawings for a couple of book covers for a local publisher, Baker Book House, which was in September of ’09. I don’t remember the book titles, but I remember one of them was a picture of a lion’s face and another had a couple looking into the sunset.